Use the below Disneyland restaurant reviews to help you better save money and find the best restaurants at Disneyland. One of the most expensive parts of a Disneyland vacation is the food costs. Our strategy to minimize the food costs is to eat as little Disneyland meals as possible. To do this we bring breakfast items or purchase breakfast in the coffee shop in our hotel as well as bringing snack and protein bars so that a large sit down lunch isn’t always required. The other benefit to carrying snacks is taking advantage of the short lines that might exist during the timeframe of 11am-1pm. With the amount that we save by not eating Breakfast in the parks and only having a limited lunch, you can feel justified in a more relaxed dinner when the lines are longest and when you need a break. Below see our Disneyland restaurant reviews for our suggestions for both lunch and dinner at the Disneyland Resort. Some of the items below are linked to full restaurant reviews on our sister site DisneyDose.com. Are you planning a Disneyland vacation for your family? Share this article with them so they get even more excited about the Disneyland trip. Above all, we recommend getting the Disneyland app on your phone because when you’re in the parks- that will be your best resource for dining! Below you can find a listing of every restaurant in Disneyland, organized by land, with price range and suggestions. *Quick service stands simply for counter service- you get in line, get your food, and find a place to eat. Table service is like a sit down/traditional restaurant. Mobile ordering is a feature available on the Disneyland app that allows you to use your phone to pre-order your food at quick service restaurants which greatly cuts back on any wait time for food. $- Gibson Girl Ice Cream Parlor– this old fashioned ice cream parlor is the place to be if you’re looking for nostalgia. Quick service/mobile ordering. 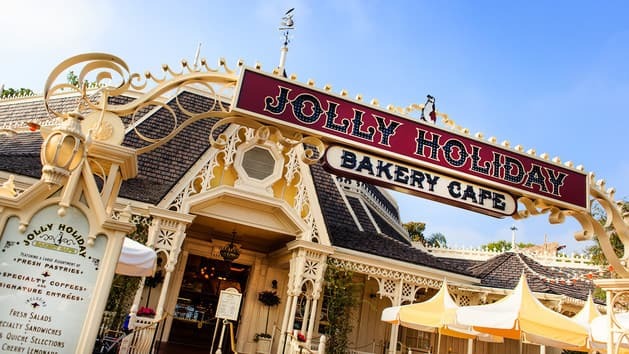 $- Jolly Holiday Bakery Cafe– this Mary Poppins themed cafe offers coffee, deserts, and cafe style sandwiches. Quick service/mobile ordering. $- Market House– looking for Starbucks? This is where you find it in Disneyland! Quick service. $-$$- Carnation Cafe– an American style cafe that offers some of Walt Disney’s favorite dishes. Their vegan burger is to die for. Table service. $$-$$$- Plaza Inn– this is where you will find the only character dining in the park- Breakfast with Minnie and Friends. Also services lunch and dinner. Table service. $-Bengal Barbecue– great roasted food. Includes skewered chicken and pork. Bacon wrapped asparagus are one of our three favorite Disneyland treats. Quick service/mobile ordering available. $- Tiki Juice Bar– this is where you find the famous Dole Whip. Pro-tip: make sure to use mobile ordering to avoid the big line. Quick service/mobile ordering. $- The Tropical Hideaway– this newer restaurant offers three different flavors of Dole Whip all with a view of the Jungle Cruise. Quick service. $- Rancho de Zocalo Restaurante– fantastic Mexican food. Good salads and variety of types of Spanish cuisine. This is one of my favorite Disneyland restaurants! Quick service. $- The Golden Horseshoe– enjoy Western style entertainment while you dine on class American style food. Quick service. $- Stage Door Cafe– you can find hand dipped corn dogs, sandwiches, and funnel cakes here. Quick service/mobile ordering. $$- River Belle Terrace– this Southern dining option offers classic Southern food in a Southern themed dining experience. Table service. $- Hungry Bear Restaurant– very good fried food, chicken fingers, burgers, fast food type. Quick Service. $- Harbour Galley– affordable salads, lobster rolls, shrimp salads. You can also find soups in a sourdough bowl here. Quick service/mobile ordering. $-French Market Restaurant– this restaurant offers affordable cajun/creole dining. Table service. $- Mint Julep Bar– this is where you find the famous Mickey Mouse beignets and mint julep! Don’t miss this one. Quick Service. $- Royal Street Veranda– this is where you can find gumbo served in a delicious sourdough bowl. Vegetarian gumbo available too! Quick service/mobile ordering. $$- Cafe Orleans- a sit down dining option with a more affordable menu than the Blue Bayou. Also, this restaurant has the famous Monte Cristo offered at Blue Bayou at a lesser cost. Table service. $$$-Blue Bayou Restaurant– An upscale cajun-creole service dining option inside the Pirates of the Caribbean ride. Table service. $- Edelweiss Snacks– this is the place to go to find the famous turkey legs in Fantasyland. Quick service/mobile ordering. $- Red Rose Taverne– this Beauty and Beast themed restaurant offers a variety of American foods. Quick service/mobile ordering. $- Troubadour Tavern– this medieval style tent offers bratwurst on a brioche roll, pretzel bites, and more. Quick service. $- Alien Pizza Planet– pizza place with a Toy Story theme. Quick service. $- Galactic Grill– offers a variety of burgers, salads, and wraps. Quick service. $$$- Tomorrowland Skyline Lounge Experience– get reserved viewing for fireworks with a variety of American food options and drinks. Table service. $- Clarabelle’s– this walk up dining service option offers salads, sandwiches, frozen yogurt, and a variety of icecream. Quick service. $- Daisy’s Diner– this is another walk up dining option in Toontown offering kid friendly options like pizza by the slice. Quick service. $-Pluto’s Dog House– featuring, you guessed it, hot dogs! The nice thing about all these walk up options in Toontown is they are conveniently located by plenty of tables to eat at. Quick service. $- Fiddler, Fifer & Practical Cafe– you can find Starbucks here along with other bakery treats. Quick service. $$$- Carthay Circle Restaurant– this fine dining option is set in a golden-era movie palace. Table service. $- Smokejumpers Grill– this American style restaurant offers cheeseburgers, fried food, salads, and more. Quick service/mobile ordering. $- Flo’s V8 Cafe– Pretty good sit down meal with food similar to that which you would find along Route 66. Lots of gravy and home style cooking. Quick service/mobile ordering. $- Cozy Cone Motel– these four cones offer a variety of churros, chili, pretzels, ice cream, and seasonal offerings. Quick service. $- Adorable Snowman Frosted Treats– this is where you will find the ‘Instagram worthy’ Pixar Pier Parfait and other lemon soft serve options. Quick service. $- Angry Dogs– this Inside Out themed stand offers spicy or non-spicy hot dogs. Quick service. $- Jack-Jack Cookie Num Nums– outside of the Incredicoaster you can find these gigantic and warm baked cookies. Quick Service. $- Poultry Palace– this Toy Story themed stand offers a variety of chicken and side dishes. Quick service. $- Señor Buzz Churros– you can find regular churros and spicy caliente churros here. Quick service. $$- Lamplight Lounge– this newer Pixar themed restaurant is a must see for the Pixar fan- also where you can find the famous lobster nachos. My favorite restaurant in California Adventure! Table service. $- Cocina Cucamonga Mexican Grill– food is similar to the Rancho de Zocalo in Disneyland Quick service/mobile ordering. $- Ghirardelli Soda Fountain and Chocolate Shop– find ice cream, sundaes, all made with Ghirardelli chocolate. You can also get free chocolate samples here. Quick service. $- Pacific Wharf Café– enjoy bread bowls, bread pudding, and other light lunch options featuring bread from Boudin Bakery. $- Lucky Fortune Cookery– this Asian themed food stand offers made to order Asian rice bowls. Quick service/mobile ordering. $- Mendocino Terrace– this wine bar offers cheese and breads at this outdoor patio. Table service. $- Sonoma Terrace– enjoy wine, California craft brews, and snacks. Quick service. $- Rita’s Baja Blenders– this is where you can find the margaritas! Quick service. $$- Wine Country Trattoria– great Italian restaurant with a view over Cars Land. Table service. $-$$- Alfresco Tasting Terrace– relax on a patio overlooking Cars Land and enjoy wine and appetizers. Table service. $- Award Wieners– find a variety of gourmet style hot dogs, kids meals, and more. Quick service/mobile ordering. $- Schmoozies!– find all the variety of smoothies, teas, and juices in delicious flavors. Quick service. $- Corn Dog Castle– no trip to Disneyland is complete without a Corn Dog from Corn Dog Castle. Quick service/mobile ordering. $- Boardwalk Pizza and Pasta– Offers a great variety of salads, pizza, and pastas that are a great break from the fried food. Stay and sit in the shaded garden seating area adjacent to Goofy’s Sky School. Quick service. $-Bayside Brews– choose from craft beers and fresh baked pretzels. Quick service/mobile ordering. $- Paradise Garden Grill– this Mexican style eatery will often have seasonal offerings and plenty of vegetarian dishes. Quick service/mobile ordering. When it comes to feeding kids at Disneyland, there are some reasonable options available for kids to enjoy that focus on pretty ‘traditional’ ideas of what kids like to eat. Keep in mind that Disney kids’ menu items are for children ages 9 and younger. Although, I’ve never had anyone at Disneyland question me when I’ve ordered kids menu items for my kid (my son is eight but he’s so tall he looks like he’s ten!) but… rules are rules. I’d imagine if folks fudge the rule- it’d be easier using quick service/mobile ordering rather than sit down dining. I’ve heard that you can’t order kids meal options for children over 9 at table service restaurants. Which for some families can be a bummer if your picky or light eater won’t like the adult options. It’s good to look at the menus (all our links above to Disney Parks restaurants take you right to the menus!) and be prepared. The Mickey Check symbol on a menu indicates a food or beverage that fits in a healthy lifestyle and each food or beverage with the Mickey Check meets Disney nutritional guidelines. So you can expect anything labeled as ‘Mickey Check Meal’ to be considered a healthier option. They typically come with a vegetable or fruit side, applesauce, and milk or water for a drink. Keep in mind if you substitute the sides then the meal might not fit the nutritional guidelines. This is just a general idea- some restaurants have more options tailored to their specific theme/cuisine option. One great dining experience is to enjoy a Disney character meal. In Disney Character meals, Disney characters circulate to each table to say hello, sign autographs, and pose for pictures. Disneyland is home to five different Disneyland character dining experiences. The experience varies quite a bit depending on each restaurant. Each one features different Disney characters and different meals. Dining packages so guests can get reserved viewing for select shows and parades included with their meal at some of the most popular Disneyland restaurants. If you don’t want to battle the crowds and plan on eating at any of these restaurants anyways, this can be a great way to go for many guests. Find our full guide to the most up to date dining packages here. Guests with severe allergies, those requiring kosher meals, or those on restricted diets can arrange assistance at City Hall in Disneyland or the Chamber of Commerce at Disney California Adventure. Gluten Free options are also listed there. If you are dining at a Disneyland Resort Restaurant, then call the restaurant at least one day in advance for assistance at (714) 781-3463. We’ve put together a full guide to dietary restrictions at the Disneyland Resort to help guests with dietary restrictions have a magical and stress free dining experience. You can also find our top eight favorite healthy food options at the Disneyland Resort in our healthy food guide here. You can also find our top ten recommendations for vegetarian food at the parks here. One of the best ways to save time at Disneyland is to take advantage of mobile ordering options to avoid waiting in long lines for food. With mobile ordering at Disneyland you will cut your time spent in lines by half or more. Downtown Disney is adjacent to the Disneyland Resort and has plenty of entertainment and dining options. Here is a list of all the dining available. $- Napolini Pizzeria– you can walk up and get the famous Naples pizza and build your own pizza. Quick service. $ Earl of Sandwich– Exquisite sandwiches in the widest of varieties. Also, Earl of Sandwich is a great place to sit down in Downtown Disney as it has covered seating. Quick service. $- Jamba Juice– an affordable smoothie place along with healthy food options. Quick service. $- Salt and Straw– this trendy ice cream place has a variety of flavors (even lavender!) and is worth a try. Quick service. $- Sprinkles– if you’re looking for sweets, this is the place to go! Quick service. $-Starbucks– if you’re craving Starbucks, you can find it in Downtown Disney. Quick service. $-Taqueria at Tortilla Jo’s– this Mexican food place has delicious options for families. Table service. $-Wetzel’s Pretzels– this is a favorite of families with affordable pretzel options! Quick service. $ –La Brea Bakery– Located just outside of the main security checkpoint to enter the esplanade, the La Brea Bakery is an awesome deli with great hot soups, sandwiches, and flat breads. This is a great lunch option just a few steps from the parks. Quick service. $$-Catal Restaurant– this is a good fine dining option that serves a variety of American and Mediterranean. Table service. $$-Naples Ristorante e Bar– a great Italian option with fantastic pizza. This is also a great more ‘upscale’ dining option. Table service. $$-Ralph Brennan’s Jazz Kitchen– offers traditional New Orleans style cuisine and jazz music served up in a two-story replica of a New Orleans French Quarter dining facility. Table service. $$- Splitsville Luxury Lanes– this upscale bowling alley offers plenty of American food with the option of dine in only. Table service. $$-Uva Bar– this upscale bar has a great atmosphere for people looking for cocktails. Table service. You don’t have to be a guest at any of the Disney owned hotels to enjoy their restaurants or character dining. And they are all within walking distance of Downtown Disney. $-White Water Snacks– inside of Grand Californian Hotel, just outside of the hotel entrance to Disney California Adventure. Good variety lunch, also has convenience store. $$$-Napa Rose– this restaurant is one of the finest available on Disneyland Resort property. You can find a wide variety of top notch food with the option of sitting at a Chef’s table. Table service. $-Tangaroa Terrace, Tropical Bar and Grill– currently closed for refurbishment, will open in early 2019. $-Trader Sam’s Enchanted Tiki Bar– a tiki bar inspired by the Jungle Cruise. Quick service. $$$-Goofy’s Kitchen– meet Goofy for breakfast at a breakfast buffet. Table service. $$$-Steakhouse 55– this restaurant is one of best steakhouses in flavor and cut of beef. The onion rings are to die for. Table service. $-$$-Surfside Lounge– offers cocktails and dining options. Table service. $$$-Disney’s PCH Grill– share breakfast with some of your favorite Disney Characters during Donald Duck’s Seaside Breakfast. Table service. $$$- Blue Bayou– The only restaurant worth mentioning from Disneyland is the Blue Bayou. It is located inside of the Pirates of the Caribbean attraction. The atmosphere is a little dark and the food is not as good for some as it used to be. But for many others, it’s one of the most popular options in Disneyland. Table service. $$$- Carthay Circle Restaurant– Fantastic restaurant that was built during the Disney California Adventure renovation. It is a combination of the finest restaurants in the US. If you are ready for a fancy meal, this is the perfect place. Table service. $$$-Napa Rose– one of the finest restaurants on Disneyland Resort property. Variety of the best food in the world. Sit at the Chef’s table to have a unique experience designed to fit the needs of each person. Table service. $$$-Steakhouse 55– rivals the best steakhouses across the US in flavor and cut of beef. While they aren’t on the menu, request onion rings. These were the best onion rings I’ve ever had. Table service. $$-Naples Ristorante e Bar– a great Italian option with fantastic pizza. Great for families while also feeling a bit more ‘upscale’ for a dining option. Table service. There are a number of helpful Disneyland dining tips listed below. Order à La Carte: During my last visit to Disneyland I was appalled to see a child who had just received his order of corn dog with a side of apples throw away the apples with the rest of the container. If only the child knew he was throwing away almost three dollars. Disneyland menus only present full meals, however you can purchase individual items à la carte. To save the most money on food during your vacation, join these restaurant deals clubs. Do not join these clubs more than two weeks before you vacation as most send out specific introductory coupons. Earl of Sandwich – This is one of our favorite lunch spots in Downtown Disney. Here you will find great sandwiches and salads. When you join their online eClub, you will immediately be rewarded with special bonus coupons. This club also sends you a FREE sandwich on your birthday. They do not check ID for your actual birth date. Patina Group – This restaurant management company operates the Catal, Tortilla Jo’s, and Naples restaurants. When you subscribe to their online Patina Restaurant Group List, you will be sent special offers and a $30 discount coupon for use on your birthday at any of the three restaurants. The coupon is sent about a week before your listed birth date and can be used for 60 days. The restaurant will check your ID to verify your birthday and that you are over 21. Reservations must be made for after 5pm for the coupon to be used. Mimi’s Cafe – This chain restaurant located just across Harbor Boulevard from Disneyland offers nice breakfast food and a great deal for members of the eClub. This is a nice option for breakfast if you are staying on Harbor and don’t like the food offered at your hotel. When entering information, use the zip code 92802 to get specific deals for the Disneyland cafe. When you join the Mimi’s eClub, you will immediately receive coupons for free food upon signing up and on your birthday. These coupons do expire, so be sure to wait until 1-2 weeks before your vacation to register. Jamba Juice – has an insider program that sends out deals frequently if you are in need of a snack. There are a few other chain restaurants in the area that provide eClub deals, however during your travels I highly encourage you to branch out and either just have food on Disneyland Resort property, or take a look at the top restaurants around Disneyland on Yelp. Try the local food! It does not disappoint. You can also check out our full guide to saving money on food at the Disneyland Resort which lists over 40+ delicious and cheap food options! The very best way to save money on food at Disneyland? Avoiding eating in the parks at all costs- if you can! One of the things that not many guests know about Disneyland is that there is a picnic area available for guests to enjoy outside food. 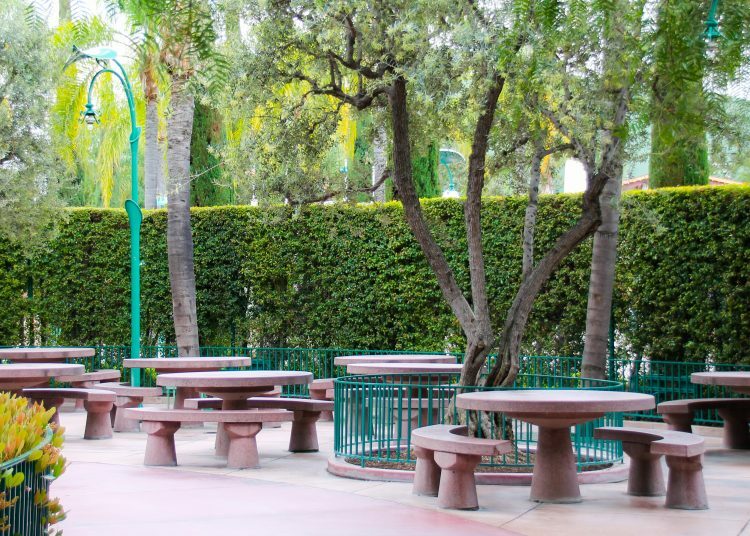 You can find the picnic area to the immediate left, if you are facing the Disneyland gates, outside the entrance to the park. And rather than hauling around a cooler all day (pro tip: Disneyland won’t allow hard side coolers inside anyways but soft side ones are fine) use the lockers that are available outside the gates (where you could put a hard side cooler) or inside the parks. These lockers are a great convenience anyways so you can store extra coats, souvenirs, etc. Locker rentals are available for different prices depending on the locker size. Inside the parks, lockers are available for $7 and $10 per day. Outside the parks, lockers are available for $7, $10, $11, $12 and $15 per day. Lockers provide unlimited access throughout the day but you can’t leave items in them overnight. So if you are looking to be frugal when you visit the parks, just stock up on lunch supplies at a nearby grocery store or CVS and just bring your own lunch! It doesn’t have to be a hassle and can easily save you $20 per person for one meal! If you have a big family, that can be a big savings. And if your kids are picky eaters, sometimes bringing what you know they like instead can be better than risking dropping money on food they won’t eat. To book a meal reservation at the Disneyland Resort, head to the official Disneyland website or call the reservation hotline at (714) 781-3463. I think you need to add more reviews of restaurant inside Disneyland. The food and service is great at Cafe Orleans. Made reservations and had a great dinner there. Also for quick service you should add the Bengal BBQ to the list. Food was good and it wasn’t crazy expensive. We just updated our restaurant guide to include more restaurants inside Disneyland- hope that helps! As time goes we’re going to work on adding reviews for each restaurant. I haven’t been to Calif Adventure in over a year. You didn’t list the Boudin bakery or the restaurant. Has it been changed?